Starting school is a huge step in a little person’s life! Many schools have pre-prep programs and orientations for kids – find out more by contacting the relevant school. There’s a full list of Logan primary schools here. 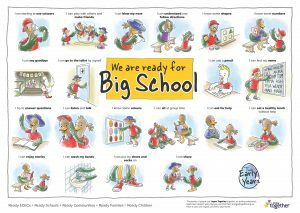 Are we ready for Big School? A checklist – Download, print and tick off as you go! In terms of getting ready – check out our poster below and see all the ways you can assist the child in your care to be ready for starting Prep.